If you are looking for a lightweight solution to mountain walking, trekking or climbing then the Alpine Ascent 40:50 Rucksack is an ideal choice. With a generous, and further extendable, capacity it's the perfect size for a day trip or an over night on the hill, and Lowe Alpine's moulded back system is comfortable, supportive and snow shedding, while load stability is ensured thanks to grip panels. A chest strap and stowable hip belt secure the pack with compression straps pull the load closer to your back so less pressure runs through it. the hipbelt can be stowed when using the pack with a harness. 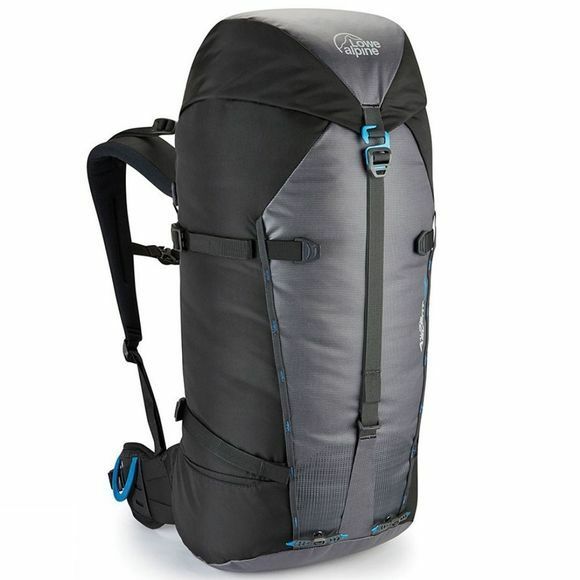 A number of features on this pack make it great for climbing. Hip belt loops and external lash points provide plenty of space to stow your gear, and headlocker ice axe attachments are great for winter mountaineering. A top tensioner allows you to stow your rope, and hydration compatibility mean you can enjoy a drink without removing your pack, essential if you're on the face. It also has mitt friendly buckles and large grab handles for clipping to belays, so it's easy to carry in any situation. The pack is completed with a zipped security pocket within the lid to keep your valuables safe.